Mick Follari has enjoyed a serious pursuit of photography for over two decades born of remote foreign alpine climbing adventures, though the affair began as a BMX/skateboarding kid and a darkroom. Culture and simple traveling moments, quiet landscapes in deep far-flung natural settings are what motivate him most. His images have been published with Men’s Journal Magazine, National Geographic, Origin, and with commercial clients such as Marmot and La Sportiva. 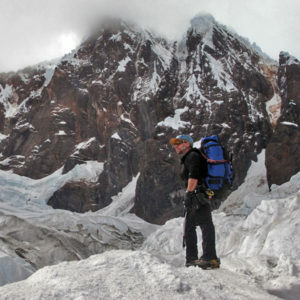 Video captures have been used in several films such as the Incan Odyssey and the Zanskar Odyssey both Marmot-sponsored full-spectrum climbing adventures involving high-altitude bouldering and alpine first-ascent attempts. In 2013 he received the prestigious Copp-Dash Inspire Award to travel to Afghanistan to explore virgin peaks and faces, and shot, produced and edited the short feature Something To Live For which was featured in numerous film festivals around the world. That same year he made his 10th expedition to Peru, returning to the perilous unclimbed face of Santa Cruz that had nearly killed his partner the year before. He’s had 20 years of experience on remote high-altitude ascents in the Himalaya and Andes, and rock and ice climbs throughout N. America and elsewhere in the world. He has participated as climber and photographer on the Zanskar Odyssey and Incan Odyssey: both Marmot-sponsored full-spectrum climbing adventures involving high-altitude bouldering and alpine first-ascent attempts. A seasoned cultural observer with 25 years of travel to over 35 countries, he speaks Spanish, Italian and French and has spent considerable time traveling in over 35 countries all over the world; in mountains, jungles, deserts, beaches, small towns, and large cities. He has also spent a decade doing web design/development and programming and bring that experience and skill set to the team. Lately, he has been honing skills in film-making and production, shooting and editing short pieces and working toward long-form stories. He is also turning to architectural and product photographer to balance his adventure and commercial work.